The Edward Gorey exhibition Gorey's Worlds at the Wadsworth Atheneum Museum of Art is on display February 10 - March 6, 2018. 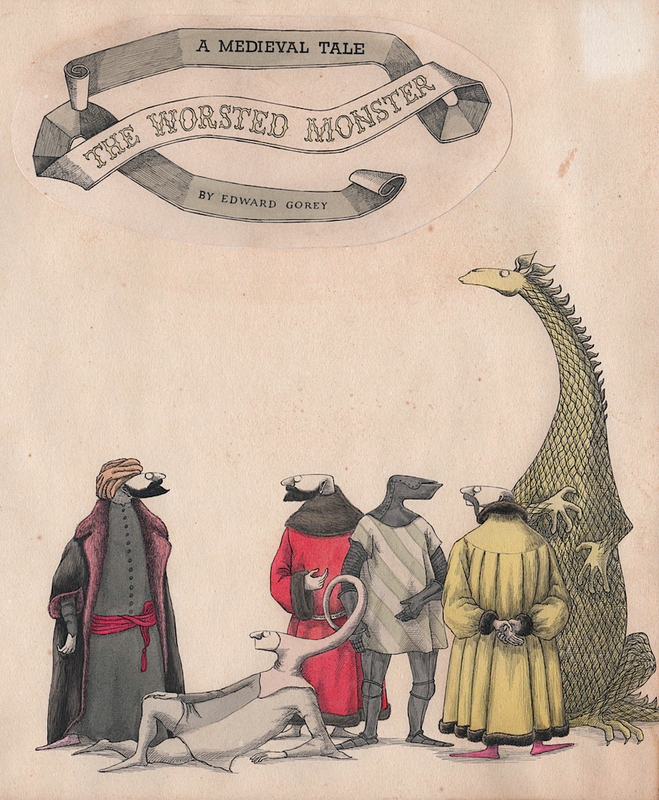 Long after this interesting exhibition closes, the accompanying book Gorey's Worlds (Wadsworth Atheneum Museum of Art, in association with Princeton University Press, 160 pages, 2018) by curator Erin Monroe will be a vital reference for those interested in Mr. Gorey's works. The lavishly illustrated volume focus on the portion of Edward Gorey's personal art collection which the artist bequeathed to the Wadsworth upon his passing in April 2000. The gift of 73 paintings, prints, and drawings provides unique insight into the art that excited and inspired Mr. Gorey daily. 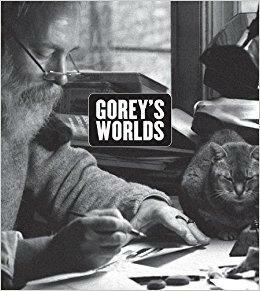 Supplementing the gifted works are works by Mr. Gorey himself. Visual and contextual comparisons are made in the volume's four essays by various contributors, each of which highlights a different aspect of the exhibition. 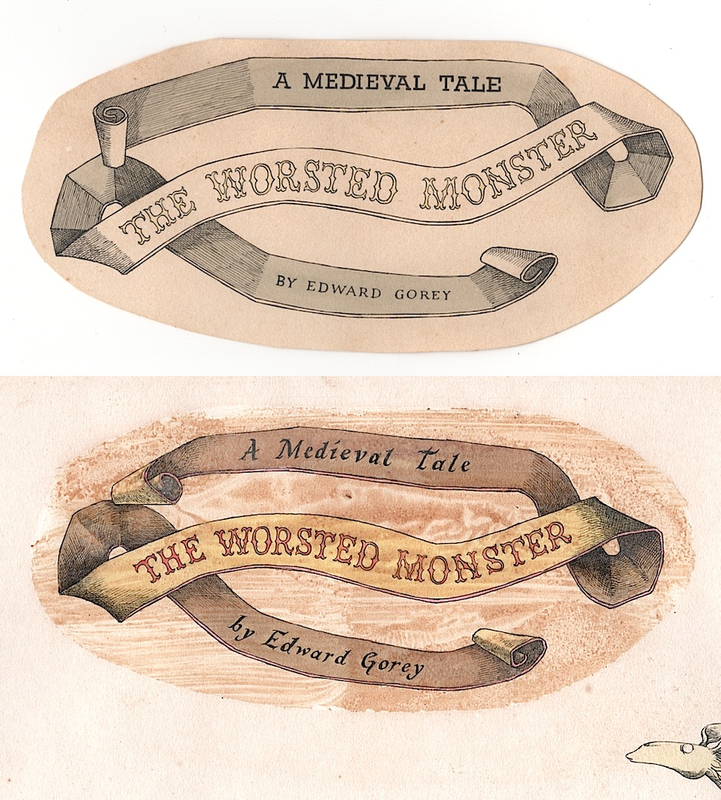 Gorey's Worlds can be ordered from the Wadsworth HERE. The Worsted Monster is an enigmatic work, or works, by Edward Gorey. Begun in the 1950's and never published (or completed? 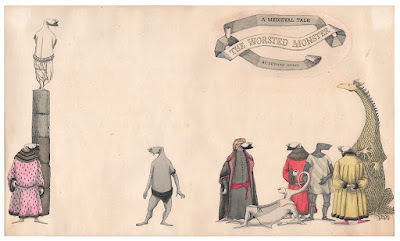 ), the first incarnation of The Worsted Monster is a self proclaimed Medieval Tale that features a cast of male characters and one large dragon, presumably the monster itself. A completely revised tale which shares the same title appeared in the June 1975 issue of National Lampoon Magazine as a toy theater, complete with sets, Dramatis Personae, and a libretto (see my post from August 136, 2013). Several pieces of artwork from the 1950's version were displayed at The Edward Gorey House in 2016 as part of their Artifacts from the Archives exhibit. This exhibit reunited interior drawings from this book that remain in the Gorey archives with this dust wrapper design that was borrowed from a private collection. The dust wrapper artwork is now in my collection. An interesting characteristic of this piece of art is that the title was reworked by Edward Gorey and a changed version was pasted over the original title. When I acquired the piece, the seventy year old glue used on the paste-up had dried out and the title was in danger of becoming detached from the surface of the artwork. As part of my conservation of the piece, I gently removed the paste-up which revealed the original title drawing. After documenting the original version, the revised title has been repositioned using archival materials. Surprisingly, there are only slight variations between the two titles. The original version uses more color and the hand lettered type on the scroll is less formal. The angle of the scroll has also been altered slightly in the new version. 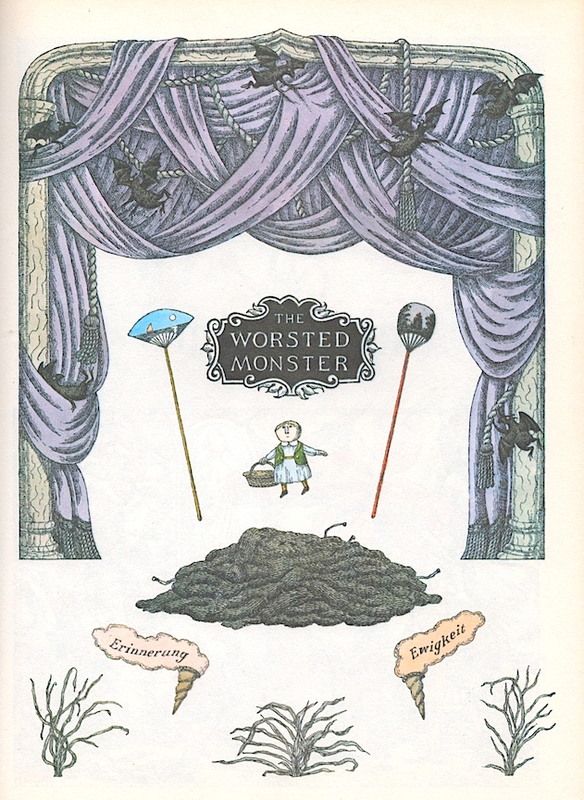 This is a clear example of Edward Gorey's attention to balance and detail in his art. The newer, more monochromatic title gives more emphasis to the colorful gentleman and dragon. The cover of the book, as shown in the cropped photo above, has a pleasing composition. Presumably, had this title been published, Mr. Gorey would have also hand lettered the title for the spine of the book and added that to the center of the drawing. It is also worth noting that this would have been a very large book if published life sized to the artwork since the cover would have been 11 1/2" tall.